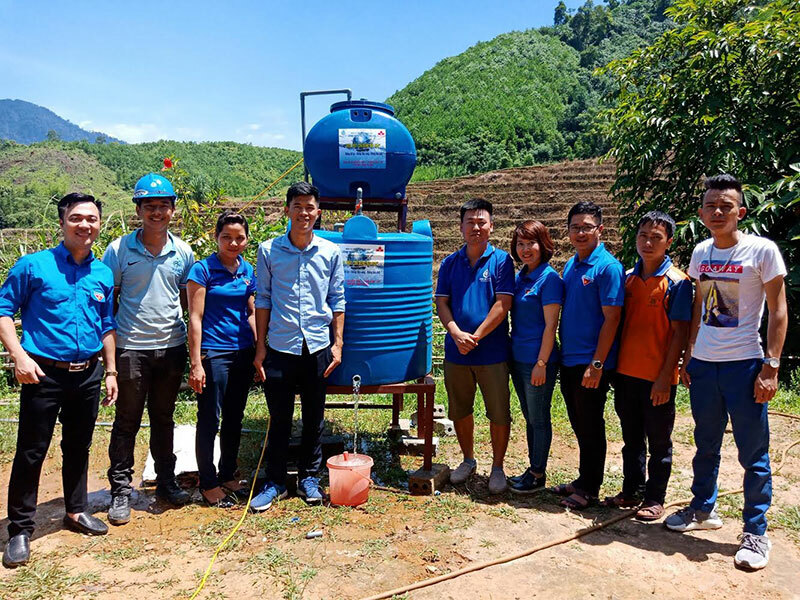 VietNamNet Bridge – After selling his assets and giving up a business which brought stable income, Vu Tien Anh launched a startup selling his MET water treatment system which has been honored at many international invention contests. Truong Dang Cac of Thai Binh province owns the system. He demonstrated its effectiveness by comparing water in one glass taken from a well and another glass of water treated by MET (Mechanical Energy Technology). He poured tea into both glasses. The glass on his right immediately turned black, while the filtered water in the other glass remained pure. The system was invented by Vu Tien Anh, director of TA Water Treatment Company and his father in law. Some years ago, the father in law designed a water filtration system of his own with steel tubes which looked like a spraying frame. The simple product was improved to become more useful. He and Anh decided to set up a company in 2016 to commercially develop the product. After selling his assets and giving up a business which brought stable income, Vu Tien Anh launched a startup selling his MET water treatment system which has been honored at many international invention contests. Not only able to treat underground water, Anh’s system can also treat domestic waste water, waste water from industrial factories, hospitals and lakes. The most outstanding characteristic of the system is that it is a ‘three-no system’ – no filter cartridge, no chemical and no electricity. According to Anh, domestic waste water does not have a high concentration of solid impurities, but has protein and animal fat, mixed with washing liquid. It is difficult to treat this kind of waste. However, the system can do this, thanks to the feature eliminating impurities. MET does not generate sludge like other technologies which use chemicals. Waster water will be driven to the primary tank where solid objects, leaves and humus are removed. After that, the preliminarily treated water will go to the secondary tank and to the treatment unit. Under propulsive force, compression, gravity and radial forces, impurities will be eliminated. Anh said his water filtration system is useful in flood-stricken areas where there is not enough clean water for daily use. The system doesn’t require regular maintenance. Only the sand layer needs to be replaced every three to six years. A report shows that though 84.5 percent of rural people can use hygienic water, only 42 percent of the number of households using clean water can meet the MOH (Ministry of Health) standard. Only 32 percent of households can use water from concentrated water supply works, while 68 percent get water from drilled and dug wells or rainwater tanks.